The cosmopolitan d’Albert became known through his 21 operas. His works for the concert hall, on the other hand, are less numerous; two symphonies, two piano concertos, a cello concerto as well as a few works for orchestra. He was born into a family of Italian descent. His grandfather was Aide-de-Camp to Napoleon I; it was he, who changed the name Alberti to d’Albert. Amongst his ancestors was also the composer Domenico Alberti, who gave his name to the “Albertibässe”. Although he grew up in England, his father was a ballet coach and dancing-master at the London Covent Garden, German was spoken at home. As he felt bound to Germany he used the German spelling of his Christian name, although he kept his English passport until the end of the First World War. Thereafter he became a Swiss citizen. Eugen d’Albert began his carrier as a pianist, who had taught himself to play the piano. At the age of ten, he was already accepted as a scholar to the “National Training School for Music” set up by Arthur Sullivan. In addition to studying the piano, he already began to compose. He received lessons in harmony and counterpoint from Sullivan himself, who was a celebrated operetta composer. D’Albert’s capabilities as a pianist were eminent. And so Franz Liszt took him on and gave him the final polish as a pianist. Liszt referred to him as his most important pupil and jokingly called him Albertus Magnus. He began a triumphant carrier as a piano virtuosi, at the same time, however, he busily pursued his ambitions as a composer. To begin with he mainly composed the works referred to above for the concert hall, before he almost exclusively turned to the opera. His operas initially were strongly influenced, as was the case with so many other composer of this period, by Richard Wagner. His first great success came with the cheerful one-act “Die Abreise” (1898). The verismo-opera “Tiefland” (1903) brought him world success. None of his subsequent works could achieve such success. In 1907 he became director of the Hochschule für Musik in Berlin. D’Albert was married six times. Amongst his wives were the singer Hermine Finck (who had the greatest musical influence on him) and the pianist and composer Teresa Carreño. For legal reasons he travelled to Riga in order to divorce his sixth wife there, where he died in 1932. The cello concerto was composed for the cellist Hugo Becker, who was born in Strasbourg. He was very much in demand as a teacher and taught at the Hochschen Konservatorium in Frankfurt and later at the Hochschule für Musik in Berlin. The cello concerto, which was completed in may 1899, is also dedicated to him. At the first performance it was an overwhelming success. D’Albert therefore subsequently arranged a version for viola and piano. It consists of one movement and thus follows the tradition of the New German School. Liszt’s piano concertos could have served as a model here, or the cello concertos from Schumann and Svendsen, where the movements also seamlessly follow each other. However, d’Albert’s cello concerto is structurally more freely formed. The work has a surprising start. There is no long introduct-ion, as for example in the cello concertos from Dvořák or Svendsen. The cellist is present from the first bar. The second surprise: the main theme, that sounds in bar three, is not introduced by the soloist, but by the oboe. The cello accompanies with arpeggios. From letter A the clarinet enters with the theme, already now in E major. The cello takes over the theme three bars after letter B; this time above arpeggios from the violins and violas. The second theme, eight bars before letter G, is introduced by the soloist. From letter Q the horns lead into the second section (andante con moto) above trills from the cello. This section is in F sharp minor (tritone to the central C major key of the work!). 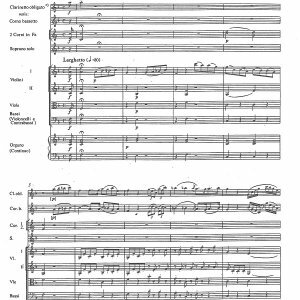 The sect-ion is opened by a lyrical theme in the first violins that is taken up by the cello at letter R. The third section (allegro vivace, 6/8 measure) also starts without a brake. With many continuous quavers and repeated notes it is written in the style of a tarantella. It takes the place, as it were, of a scherzo. In a development section, which starts at “lo stesso tempo” (p.45), the two main themes of the first section are elaborated. This development section leads on to the “piú tranquillo (come prima)”, in which d’Albert takes up the start of the concerto and thus creates a formal parentheses. The instrumentation is very classical and consists of double wood wind, four horns, two trumpets, timpani and strings. A common problem during the performance of works for cello and orchestra, the balance between orchestra and solo cello and the associated danger of submerging the soloist, is with this instrumentation already somewhat alleviated. This instrumentation is also remarkable for the significant role of the wood wind, which not only introduces thematic material, but also often corresponds with the soloist (parti-cularly clearly from eight bars before letter U, the cello in dialogue with the two flutes). The soloist is however given considerable expanse to develop. 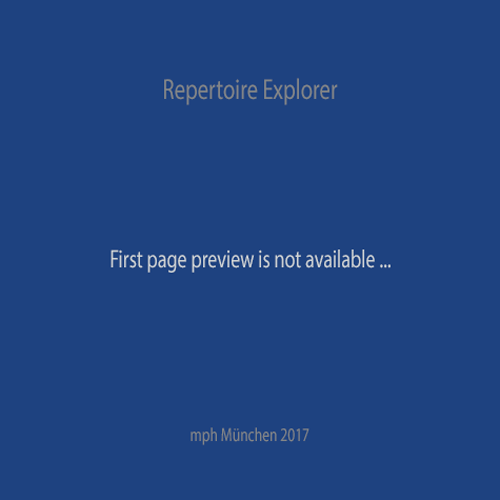 For performance material please contact the publisher Peters, Frankfurt. Reprint of a copy from the Musikabteilung der Leipziger Städtische Bibliotheken, Leipzig.